Info It's fun being a jerk. Pop this guy's bubble! Bubblegum Blues is one of Kat and Ana's microgames in WarioWare: Twisted! The player will be controlling a finger. The game's purpose is to pop the sleeping person's bubble before time runs out. 1st level difficulty: The bubble is big. 2nd level difficulty: The bubble is a bit smaller. 3rd level difficulty: The bubble is smaller. In the first level, there is a Super Mushroom-like mushroom printed on the boy's shirt. In the second level, there is a Fire Flower, and in third level, there is a Star (although it has a smiling mouth). 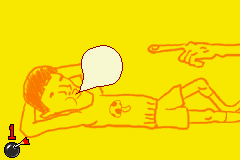 In the Japenese version of the microgame, the bubblegum is a mucus bubble coming out of the boy's nose.